Sablefish, butterfish, black cod – by any name, people call this fish delicious. Its delicate texture, buttery flavor and rich omega-3 content add up to a high value fishery: while sablefish make up a small portion of commercial catch by volume, their high price generates a lot of income for Alaska’s seafood industry—a big economic bang per fish. To keep a fishery productive over time, managers need to know how fish populations respond to environmental changes and human activity. Understanding how these factors influence survival of vulnerable juvenile fish is crucial to predicting and ensuring recruitment (the number of fish that grow to a size commercially profitable to catch) to the fishery. Despite their value in the seafood industry, there is a lot we don’t know about sablefish. 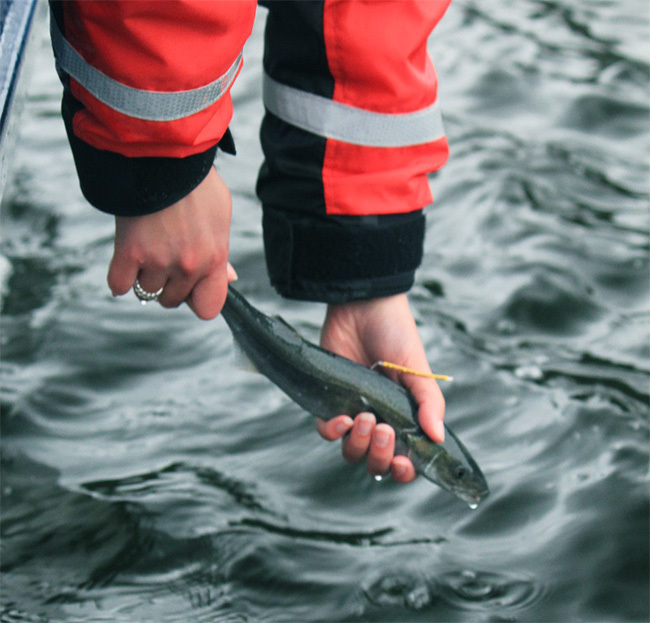 Coutré is lead author of a new joint NOAA Fisheries and University of Alaska Fairbanks study that documents for the first time fine-scale vertical movements of juvenile sablefish in the wild. The study begins to fill a gap in our knowledge of the behavioral patterns that influence juvenile sablefish survival in nearshore habitats. First, they had to find them. 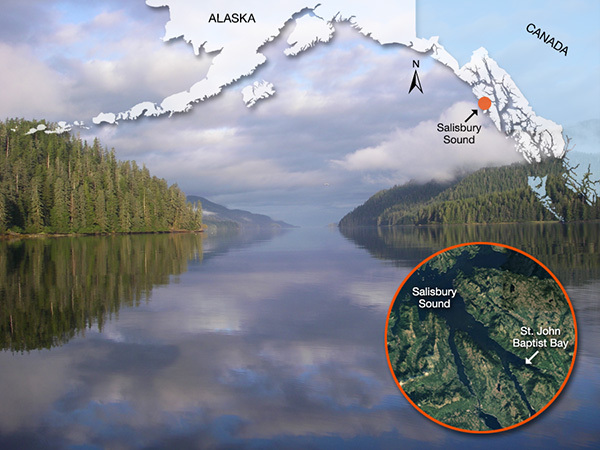 By studying previous NOAA research, Coutré’s team learned that there is one place you can count on seeing young sablefish in most years: St. John Baptist Bay, in Southeast Alaska. Juvenile sablefish are vulnerable to a wide range of predators: seabirds, salmon and other big fish. They in turn eat both pelagic prey that swim in the water column, like small fish and krill, and bottom-dwellers such as worms and clams. By moving up and down in the water column, fish can manage trade-offs among food availability, predation risk, and temperature (which affects how much energy they spend) to benefit their growth and survival. For example, juvenile sockeye salmon swim toward the surface at dusk to feed, then return to deeper waters to avoid visual predators during daylight. To track vertical movement patterns of sablefish in the wild, NOAA scientists caught 13 wild juveniles in the bay using hook and line, tagged each with acoustic transmitters, then released them near the capture location. Six of the fish remained within detection range (about 200 meters) of two acoustic monitors and were observed for the duration of the study, from October 2 to November 18, 2003. The tags transmitted depth, date and time to the nearest 5 seconds for each fish. These fish spent most of their time near bottom (deeper than 30 meters) throughout the study. But all six fish made excursions to shallower depths. The number of trips also depended on the date, peaking between October 30 and November 9. “We don’t know why for sure, but this period coincided with the new moon and spring tide, when the difference between high and low water is greatest. It may be that the greater tidal exchange during that time brought food into the bay. Or it could be a seasonal effect—we know that some krill come inshore in the fall,” Coutré speculated. 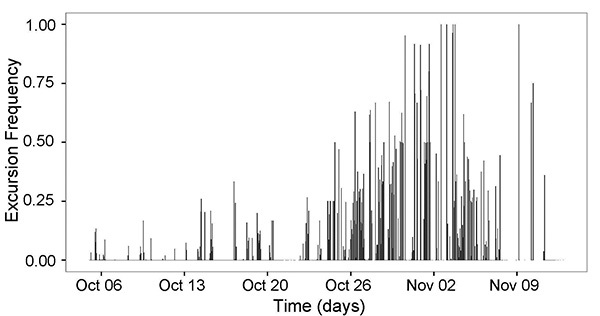 Average number of excursions by six juvenile sablefish from October 6 to November 14, 2003. Knowing where young sablefish are at different times and when they are actively feeding will help scientists figure out how environmental changes and human activity influence their survival.